What do you get when architects deconstruct a sphere? 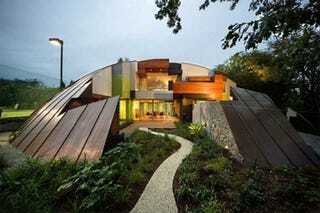 At least in this case, you get a house that looks a lot like a UFO. From inside to out, the Klein Bottle experimental house plays with the theme of a mathematical puzzle that manifests in an interesting hodgepodge of geometry. But cleverly hidden within these angles and crevices is a rain water collection system and solar paneling (because aliens hate to pollute).